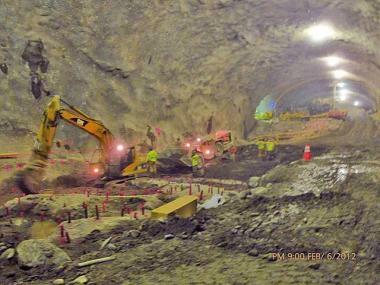 Mining at the cavern that will house the 72nd St. station. MANHATTAN — The Federal Transit Administration awarded $197 million in funds Monday for the Second Avenue subway construction's first phase, representing a chunk of the $1.3 billion in federal funding committed for the MTA project. The $4.45 billion first phase of the project, which will extend the Q line from East 63rd up to East 96th street, is expected to be completed by December 2016. It will connect three stations — at East 96th, 86th and 72nd streets — to the station at 63rd Street and Lexington Avenue. Just a day after that check was in the mail, government officials learned that the federal government's final installment, of $123 million, will also come through — after some doubt over its fate during budget negotiations. Rep. Carolyn Maloney's office confirmed that the funds will be included in the proposed Fiscal Year 2013 budget being presented to the House Appropriations Committee on Tuesday. "These federal funds will help keep this critical Second Avenue Subway project on track," Maloney said in a statement. "It’s projected that, immediately upon its completion, the new subway line will carry more than 200,000 passengers every day." Maloney, who fought for decades to secure federal funding for the subway, which is one of the biggest infrastructure projects in the country, applauded the Obama administration for its commitment to the project. "Initiatives like the Second Avenue Subway help keep America competitive in the 21st century global economy,” she said.